1968 Ludwig Black Marine Pearl, 5 Piece Drum Kit - SOLD! Okay, here’s the story with these drums. They’re mostly a 1968 black marine pearl Ludwig 5 piece, but the snare is a matching, 14 inch, 6 lug, mid-1960’s Slingerland wood snare! The serial number on the floor tom dates it at 1966, but it doesn’t take a big stretch to imagine a 1966 badge going on a 1968 drum. The usual procedure was that the badges would get dumped in a bin by the thousands, and when they ran low, they’d replenish them. It’s very easy to see how a badge could get lost for a year or two at the bottom of the heap! All of these drums were bought together as a set, with the obvious exception of the snare, in 1968. The 20 inch bass drum is “virgin”, in that it has no mount, and therefore no holes, for mounting the rack toms, which are both 13’s. I’ve mounted the toms on arms that are clamped to my cymbal stands and this seems to work very well. These clamps will be included. One of the outer hoops on the bass drum has been changed for a plain black hoop. The second, original hoop has the black marine pearl finish circling the hoop, in the middle. Drums are all in excellent condition, with no obvious defects. Cymbals and stands are not included, but are available. Drums can be shipped “nested” or each in their own separate carton. Your choice. Just remember that separate cartons will cost more for shipping. 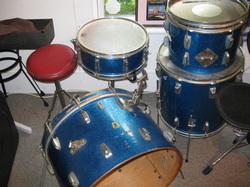 1959 Ludwig blue sparkle w/ matching snare - SOLD!